Now that the new house is actually being built, we in the midst of the fascinating business of the interior design of the house. Although my designers, Suzanne and Keith (VP at Suzanne Kasler Interiors), have been working on the project since the beginning (September of 2009), the focus during the first year was primarily on the architectural design of the house, and some of the ‘attached to the house’ aspects such as tile, plumbing, and trim. While the architecture of the house was being designed, we discussed some of the colors of the house at a high level, but more as it related to the overall feel we wanted to achieve and how that worked with the architectural and landscape design. Once the house build started, our attention turned to the decor. Although I have used designers in the past, I have never worked on a house from scratch, and I have been fascinated by the approach to the process. Most of our meetings have taken place in Suzanne’s office (where Suzanne has a vast library of fabric samples and catalogs), with occasional forays to specialized stores. The office space is well known in the blog world, as it was featured in Atlanta Homes & Lifestyles. It is an open and airy space, filled with light, and a great place to evaluate house plans and fabrics. Here is a snapshot of the wall as it appeared at the end of last year – this is our third iteration or so. When we first started talking about the color palette for the house, this wall was filled with dozens and dozens of fabrics, rug samples, wallpaper samples. Slowly but surely, we are starting to narrow down the palette and selections. 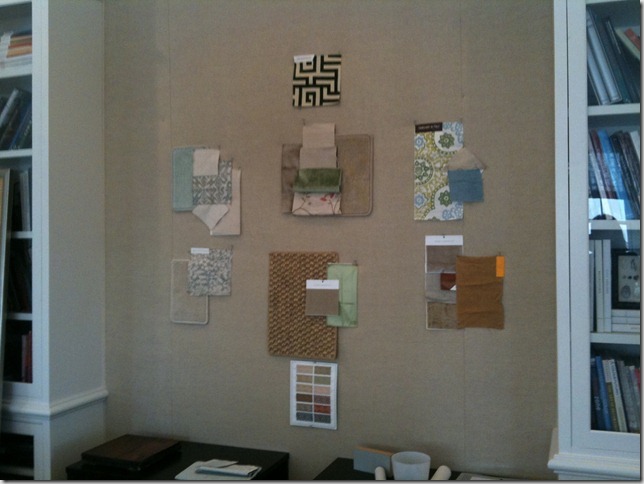 It provides such a great way to discuss the options, as fabrics and rug samples can be moved from one place to another. In December it was time to refine and confirm the selections, so we ventured out to look at rugs. I love sisal, and requested that we consider sisal for some of the rooms (I could have a whole house in sisal! ), but Suzanne also wanted a subtle geometric rug for one of the rooms, and something soft for the master bedroom and family room. After looking at numerous rugs, a clear color palette and schematic began to emerge, which in turn helped us eliminate some of the fabric selections on the inspiration wall. We found this rug in the design center – we all immediately knew it was the perfect start to the family room. I learned that some rugs have ‘light sides’ and ‘dark sides’ based on how you look at the rug; this view is of the dark side. I absolutely love the colors in this rug, and Suzanne felt that it was really ‘me’. Having the rug to work with enabled Suzanne to determine the rest of the selections for the room, both fabric and furniture. It’s going to be beautiful! Suzanne has said from the beginning that she wants a geometric for the library, but not one that has a ‘retro’ feel. This carpet from Stark is a leading candidate. Here is the most recent iteration of the idea board – the fresh fabric in the upper right is for the kitchen, underneath that is the library; in the middle – on the top is fabric for stools in the entry, below that is the living room, and below that is the dining room. The fabrics and rug samples on the left are under consideration for the master bedroom. Some of the furniture and lighting have already been selected; we are also looking for antiques to help give a more balanced feel to the rooms. Suzanne and Keith have been so wonderful to work with – I highly recommend them for anyone considering a design project! When I first started looking for a designer, I was nervous about approaching Suzanne (in my world, designers like her are celebrities! ), but I can’t imagine doing this project with anyone else. My advice for anyone thinking about a project is to consider calling the designer you really want to work with – don’t assume that they are too busy, or that their fees are too high, or that they only do whole houses (sometimes this is the case, but you never know). It never hurts to have a conversation and find out whether your project is a match for their firm. I have learned a lot going through this process, and am thrilled at how everything is coming together so beautifully. It is Suzanne’s goal to create a decor that can be lived with and enjoyed for decades – and that every room be used - and not have to redo the decor every 10 years. She is creating an environment that reflects my husband and me, but also has a level of sophistication that will age beautifully. Also, in her signature style, she is mixing the high and the low - we have many special pieces, but we also have many pieces that make it all work for my budget. Since we are focusing on the architecture first and foremost right now, we are going to have to do the decor in phases (so, alas, an empty living room for a while - but at least we will have our piano in there!). Suzanne has been great in helping me prioritize and stick to my budget without sacrificing style and beauty. Suzanne Kasler Interiors has a newly redesigned web site – full of beautiful pictures and inspiration. You can visit it at http://www.suzannekasler.com/. There are lots of great pictures of her design projects, as well as information on her lines of furniture, fabrics, lighting, and accessories. There is even a sneak peek of Suzanne’s new line of fabric for Lee Jofa. Enjoy! In other news, I have decided to dip my toe into the waters of Twitter - @TTIBlog is how you can find me. Click here to check out all of the art! http://www.quatrefoildesign.bigcartel.com/category/art – and bookmark this page as I will be adding new small and medium sized pieces all of the time. Love the rugs - I usually start my designs with rugs. If I know that the rug will be neutral and plain, then I pick a great fabric. WOW - I love peaking into the design process of one of my favorite designers! I wish I could be a fly on the wall at one of your meetings. I admit that I am insanely jealous! New home, new design by the great Suzanne K, and lots of beautiful ideas and possibilities. I can't wait to see how it all comes together. Love absolutely everything you are choosing - the rugs, the palate etc. I so wish having a project like this. Am working on a very tiny one right now which is fulfilling my fix for the moment. Must be wonderful working with a talent like Suzanne! And now that I know you're on twitter - I'll send you a tweet to say hi - just a warning - VERY addictive!! Suzanne has always been one of my most favorite designers! So glad you shared this...I love seeing all of your ideas and this one in particular has started the creative juices flowing for sure! Its time to re-do my shop so I'm trying to make some decisions on that! Thanks for the inspiration! It is so beautiful and you are so generous to take us along for the ride. I am enjoying every step. I'm having a lot of vicarious pleasure watching your house come together. Thanks especially for sharing the process with the swatches and fabrics - it's fascinating! Great post. Thank you for saying that one should contact the designer they really want to work with instead of worrying about if she/he is too busy or expensive. Preconceived notions about what someone charges based on their reputation can count you out before you even begin! Love Suzanne K and enjoyed seeing that most designer's processes are about the same. I surely hope you will give us a pictorial tour of your gorgeous new home when it is finished! It is going to be beautiful!!! OH, and love her paintings. Beautiful rug! This is very exciting. Glad we are along for the ride. Great selections. I saw a similar rug in a picture of designer Betsy Brown's office. It's a beautiful color and pattern. Holly, Love, love, love your colors. Thanks for sharing the whole process....I know you're going to get what you love! BTW, haven't forgotten about the small paintings! I'm glad Melissa's were a big hit.....they look great. I adore what you've chosen so far. It all must be so exciting! Beautiful choices..what a wonderful process!! Love the bright and fun fabric selected for the kitchen. Thanks for sharing! Holly, how exciting! I honestly can't even imagine how exciting this must be for you! I love the direction so far. Knowing some of your favorite rooms and Suzanne's work, I am not at all surprised by the soft and gentle hues and sophistication that will be in everything. I cannot wait to see photos of the rooms...! Your rug is stunning, the entire color palette is gorgeous. Thank you for the peak. What a wonderful experience to work with Suzanne Kasler! Your color palette is just beautiful! This is going to be great! Thanks for sharing you're really amazing! I'm in the continual process of updating my office and loved seeing Suzanne Kasler's office for inspiration. How exciting to see your home come together too! The fun part begins...it's so thrilling and exciting. I love seeing all your color/fabric selections, they are so reflective of everything you love and talk about on your blog. Too funny, about the light vs. dark side of a rug I just assumed everone knew that, but I mentioned the light side of a rug that my husband brought home form his travels for our bedroom in a December post and received 2 emails asking what did I mean!? So exciting to see everything evolve! Love the palette. Thanks for sharing the process with us. This must be such an exciting time for you. Can you even sleep at night thinking about it? I can't wait to see the next phase. Thanks for sharing your experience working with Suzanne and Keith. Wow, this is the fun part now! That rug is absolutely stunning...love it! And, the design board is looking fabulous. The design process is all encompassing and floats on emotions towards the things we love. Bringing them all together takes patience in a process that works every time. Love how it forms and how each client experiences it differently. That's what works and it's all with trust every step of the way as your dreams come true. Great post. I loved the peek at how Suzanne Kasler works. You definitely have a great designer to work with. I'm looking forward to seeing more! I love your selections and that rug is fantastic. I cannot remember where I read an article with Suzanne Kasler recently where she mentioned that despite all of her success...it is working with clients as a designer that she still loves most. I am sure we will no doubt see your home published some day and it will be fun to see if after following along each step of the way. This felt like a Master Class in design and working with designers. I can feel that your process has been enjoyable working with Suzanne and Keith and that is as important to the end result as the actual selections! I love Sisal as well...but am loving the Stark and the geometric --- mixing it up will keep it interesting! Also..from the previous post...I'm loving those small paintings and the idea of incorporating them into a bookshelf or tableu! Exciting! I absolutely love the carpet you've picked for your family room. 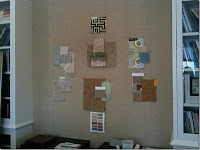 I love seeing how Suzanne's process works...very interesting, thanks for the insight into her studio and your project. Can't wait to see more! Beautiful blue rug. Who is it?